Maximum power for the heaviest garage doors. 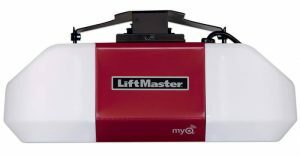 When you have heavy carriage-style garage doors or solid wood garage doors, you need a powerful and reliable opener to keep everything running smoothly. That's where the LiftMaster 8587 3/4 HP AC Chain Drive Opener comes in. This heavy-duty motor was designed specifically with your needs in mind. It features a powerful 3/4 HP AC Motor and I-beam rail system with reinforced chassis to provide maximum performance and support.